Front Row L-R: Front Row Left to Right: Dr. Jack Yazer, Lt.-Gov. 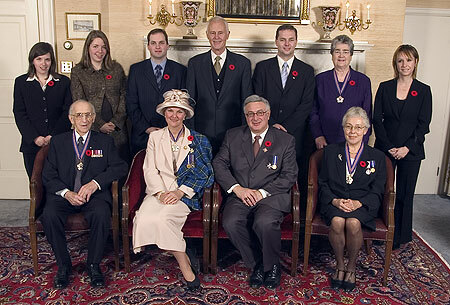 Myra Freeman, Lawrence Freeman, The Honourable Constance R. Glube; Back Row L-R: Kathleen Reddy, Helen Reddy, James Cyril Reddy (all on behalf of Michael Joseph Cyril Reddy), Premier John Hamm, Rodney MacDonald, Minister Responsible for the Order of Nova Scotia, Theresa Helen McNeil, and Laura Ann Lewis (representing Rita MacNeil). 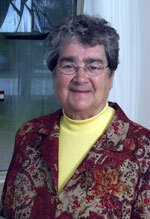 A graduate of Dalhousie Law School in 1955, she has been a pioneer in the field of law. She was the first woman city manager in Canada, the first woman justice of the Supreme Court of Nova Scotia, and when she was appointed Chief Justice of the Supreme Court of Nova Scotia, she was the first woman in Canada to be named to this post in which she served from 1982 to 1998. 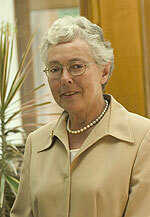 In 1998 she was appointed Chief Justice of Nova Scotia and Chief Justice of the Court of Appeal of Nova Scotia. She retired from that position December 31, 2004. A judicial leader and mentor who has won the admiration and respect of her peers, she has been active in the areas of judicial education and court administration. She has served on numerous professional and volunteer boards and committees, and her contributions have been recognized with numerous awards and honorary degrees. Recently retired from the bench, she has been appointed to serve on several boards and advisory committees, including an appointment as Chair of the Nova Scotia Arts Award Foundation. Her songs-of struggle, hardship, and hope-may be rooted in her native Cape Breton, but their themes are universal and appeal to audiences around the world. She has recorded more than 20 albums, set sales records, and had top-10 hits in Canada, Australia, and the United Kingdom. 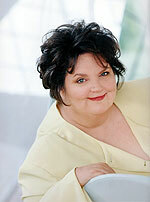 She is a Member of the Order of Canada, holds honorary degrees from five universities, and has won numerous Canadian Country Music Awards, Junos, and East Coast Music Awards. She is the most recent recipient of the Dr. Helen Creighton Lifetime Achievement Award, honouring her contribution to the Atlantic Canadian music industry. She is also an entrepreneur, television host, author, and cultural ambassador for Nova Scotia. Her invitations to her audience to drop by for a cup of tea have put Big Pond, Cape Breton, on the tourist map. She is a role model, not only for her 17 children, but also for women in adversity everywhere. She was a stay-at-home mother, actively involved in the life of her community in Upper Granville when her husband suddenly died. Seven of their children were under the age of 10. Entering the workforce, she became High Sheriff of Annapolis County in 1977, the first woman in Canada to be named to that position. Her direction and standard have directly inspired her children: two teachers and a school administrator, four police officers, an executive assistant, five public servants in the fields of finance, education, and corrections, two small business owners, a Member of the Legislative Assembly of Nova Scotia, and a communications professional. She volunteered for many community causes including Heart and Stroke, Arthritis and Alzheimer's. She delivered for Meals on Wheels and continues to volunteer at Soldier's Memorial Hospital gift shop for the Ladies Hospital Auxiliary. Theresa has also faithfully served her parish of St. Alphonsus Catholic Church in many capacities, most notably as an active member of the Ladies Auxiliary. A social worker instrumental in the development of the Department of Community Services, he was the Regional Administrator of Community Services and Executive Director of the Children's Aid Society in Pictou County, having previously served in those capacities in Queens County, Digby County, and Sydney. His sense of fairness and compassion for people in need extended to such causes as Christmas Daddies and the fund to assist families of the victims of the Westray Mine Disaster. His five terms as President of the Nova Scotia Government Employees Association in the 1970s were vital to the development of the government employee union. After retirement, he fulfilled his love of harness racing by taking on the job of managing the provincial exhibition and raceway in Truro. 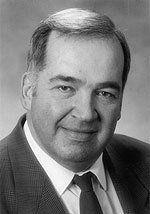 His untimely death cut short a lifetime of service to Nova Scotia and its citizens. He immigrated to Canada from Poland at the age of 14. 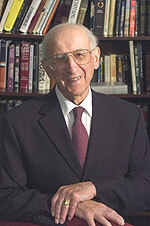 He is a successful businessman, World War II veteran, community activist, and tireless volunteer. He was the founding Chairman of the Cape Breton Regional Hospital Foundation, which raised funds for Cape Breton's first regional hospital, and he was instrumental in improving health on the island. His efforts for the youth of this province include lobbying the government to institute a graduated drivers license program and championed the Youth Speaks Up program, which helps grade six students cope with drugs, alcohol, tobacco, violence, racism, and peer pressure. His contributions to Cape Breton have been recognized with numerous community awards, two honorary degrees, the Order of Canada and he is a recipient of the Special Recognition for Outstanding and Selfless Commitment award for the establishment of the Cape Breton Regional Hospital and for his exceptional leadership in the area of community development and health care. He came to Nova Scotia to make a better life for himself, but has made an even greater mark on the lives of his fellow Nova Scotians.